The Wanderer's Lair gained its moniker based on the transient nature of the dragon inhabitants. That urge to migrate away had been dubbed 'the Tendency' and varied in its strength in each dragon and across the space of time. The Tendency is not something that can be avoided, only strictly resisted against. Dragons with the Tendency show the strength of their desire to stay in the lair through how long they stay. Many of the dragons in the lair thought themselves to be kings, queens, or deities, and often these beliefs directly conflicted with dragons that they found themselves living next to. But somehow, perhaps because many dragons came and went, everything stayed peaceful, for the most part. Clan-rocking spats happened occasionally, which usually led to the migration of a large population of dragons. Atem is the main clan leader, as designated by the clan founders. He tries to be a fair and just leader, but sometimes he forgets things. He is directly responsible for a collection of dragons, and considered Isadore an equal ruler of her own subclan at first, then her own Tier. The first subclan that existed in the clan was the Ennead. However, they had a row with Atem and a large majority of them chose to leave the lair for other homes. Only five remained. Those four were governed deirectly by Atum, who in turn answered to Atem. This subclan has since broken up. Two remained, but considered themselves part of the nocturne nook. They have also since moved on. The second subclan was the Leafbellies. Led by Isadore, a ruthless coatl, all leafbellies had one trait in common: leaf underbelly genes. After Atem and the Ennead had their fight, Atem saw fit to restrict the size of subclans to 10, and so the Leafbellies had to downsize. They have since decreased to 4, a much more manageable number. Since then, two more have left, leaving only Iacchus and Israfel as the clan's leafbellies. The third subclan, known as the Bright Shiners, was their biggest at nine members. However, a strong outbreak of the Tendency in the subclan ripped it apart. A fourth, closed membership, subclan suddenly became part of the clan when five eggs were found and all hatched minutes apart. These five unadorned dragons call themselves the New Deities and demand to be treated as such. Atem didn't have any problems with them because Daen supplied him with all the fish he could want. The nocturnes maintain their own numbers and answer to the founders, if anyone. The Nocturne Nook is self contained and doesn't contend for power. The rest of the dragons in the lair answer either to Atem or Isadore, and are generally easy going. There is no wrestling allowed in the clan, and so the number of dragons with elevated levels is low - Atem himself is the coliseum leader. The clan had shifted away from a haphazardous group of subclans to a much more organized Tier system. At the height of the system, there was four Tiers in the clan, each with a maximum of four Steps. Power divides were still difficult, though it was widely accepted that though a Tier-Two Step-One (2:1) dragon was below a 1:1 dragon, they were above a 1:2 dragon. The dragons that do decide to leave all bear with them the symbol of the Wanderer's Lair; eight breezes circled around an earthy core. The breezes denote the clan's current residence in the Wind flight, but the small seed at the middle tells of where the clan came from. The lair itself was under a ledge in an invertedly sloped rock face in the Reedcleft Ascent - the clan itself is said to be from the Cloudsong, but they decided to retain their lair in the Ascent and spend a lot of time up in their alloted space in the Cloudsong. The wide opening of the lair is protected with a strong rock wall (harkening back to the clan's Dragonhome days, where such skills were acquired) and a plethora of strong, thick, tall bamboo stalks. The larger breeds make their nests in the bamboo cover, while the smaller breeds stay closer to the rock face - the nocturnes have found a small nook in the rocks where they spend the day. As the clan grew, new accommodations were necessary. The clan moves from their small cliffside dwelling to the top of their territory in the Ascent. From there, they built several platforms and floating buildings and tethered them to the edge of the Ascent. The clan is split between who lives on the platforms and who lives on the Ascent - no dragon is restricted to one area and may move between any of the common areas. At the beginning of February (the 8th) in the clan's second year, Isadore announced the formation of the Order of the Bamboo, dragons that exhibited the natural colours of the world around them. Each one, 36 in number, bears a bamboo badge to signify their membership. She has not yet contended for the leadership of the whole clan, as Atem's loyal followers number 37, and he has strong ties to the New Deities and the Nocturne Nook. Isadore has begun to send emissaries to the Reverse, hiding in the bamboo, to seek their favour. On May 9th, Atem, tired of having to assess where a dragon fits in the tier system only to have them leave a week later, decided to do away with the tier system entirely. Some dragons continue to hold onto their tier position for a little longer. Instead, Atem has decided to recognise dragons that hold a leadership position with a special note in their papers. However, Isadore continued to fight for dominance in the lair - she wouldn't accept Atem's leadership, despite being sanctioned by the clan founders. In June, she tried to ambush Atem while he slept, but she targeted his lover instead. Atem woke with a fury that the whole clan heard. He soundly defeated Isadore again, and instead of being merciful, he sent her into the wilderness to search for the Windsinger. At the end of that year, the Reverse struck the clan in another surge for power - the New Deities rose to protect their clan from the attack. Many were lost in the chaos that ensued from the clashing of elements. At the end, only one Reverse remained and he was quick to switch sides. Three of the New Deities were also lost, though Nith returned to the lair after suffering a complete memory loss. In the aftermath of the Great Flight, Eztli proposed that the clan change their name - she had been feeling a little homesick. She proposed that they now call themselves the House of Windborne Sand, as a reminder of where then clan had come from. Several of the older dragons who remembered their lives in the Dragonhome agreed, and Atem made it official - not many dragons wandered through anymore. Nerd is quite introverted most of the time, and upon finding herself in the Wanderer's Lair, she took it upon herself to archive all of the clan's history (that had previously been recorded by Song). Eztli noticed her efforts and promoted her to serve directly under the fae founders - a very prestigious place to be. She spends most of her time reading and rereading scrolls in her own archive space (that Joao carved out for her). When she isn't there, she like to wander among the other dragons and listen to their lives. Sometimes she actively listens and asks questions, other times she sits in the background and observes. She is very particular about how other dragons come into the archives - every dragon must be properly cleaned (no mud!) and no food or drinks are permitted either. 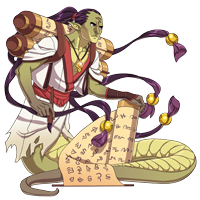 Scroll are not allowed to leave the archive except on official business, which she almost always conducts herself. Recently, Joao has started spending more times around the archives, because he has nothing else to do. She reassures him that it won't be long before the two tiny faes decide that they want to change everything, then he'll have lots of work. She's found that he's an active listener and eagerly talks his ears off. She should be doing other things, but she makes space in her schedule to spend time with him.